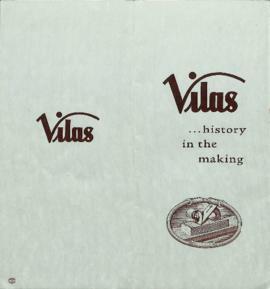 The file contains information on the history and products manufactured by the Vilas Furniture Company in Cowansville from around the 1960s. It consists of a pamphlet. The item is a letter from Doris Bridgette to Mardie recounting that she had recently been laid-off from Bruck Silk Mills in Cowansville from the 25 April 1931. 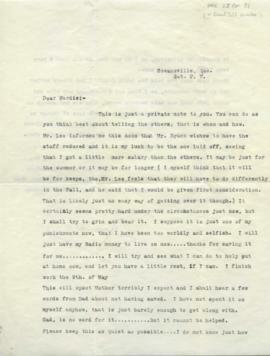 The item is a reference letter from L. Schildkraut Lee, manager, at Bruck Silk Mills (Cowansville) for Doris Bridgette, dated 9 May 1931. Item is a photograph of a bridge located in Cowansville, with a boat full of people passing underneath. Item is a photograph of the club house at the Cowansville golf course. Item is a photograph of a mill located in Cowansville, with surrounding landscape visible. Item is a photograph of a bridge located in Cowansville, with surrounding landscape visible. Item is a photograph of the main street located in Cowansville. Bridge and Fire Station, Cowansville, Que. The item is a postcard showing a bridge and fire station in Cowansville.